Here are some ways to feel more chill and heck, some apps too! Hi. I’m Abi. Anxiety used to make fast friends with me. When it was really bad, I found that I had a couple of go-to strategies that seem to work really, really well. My psychologist self loves sharing these strategies with clients. I hope they can be helpful for you too. My goal is to help people hang out in a land where anxiety is more of a short-term visitor than a long-time guest. I used to notice that it was most helpful to relax into the anxiety. Sounds odd but it really can work. Crossing my arms over my chest and steeling myself from the anxiety did not seem to work. It usually seemed to make everything worse. Instead, I would relax into the tension by tightening and pushing up my shoulders. Slowly I would then drop my shoulders away from my ears and notice that I can create the space to be relaxed if I let myself. Then, I switched to a focus on my breath. Here’s what I would say to myself: I notice my breath. Am I holding it? Most likely, I am. I take a slow deep breath in. I notice that I am quick to hold my breath again. I notice this and I slowly let out my breath again. I wait til the breath has been released and I see if I start breathing in again. If I don’t automatically do that, I remind myself, with gentle, loving-kindness, that I feel better when I breathe in and out. And I practice. In and out. Slowly gently. Kindly. I reward myself by breathing, just one more time. Maybe I smile, to myself. I am breathe-ing. I say, out loud or to myself: I am calm. I am connected. I am released. I am here. I repeat these mantras and I try to smile inward. I remember: I am always breathing in the oxygen I need for myself, to honor my body with more pure love in the form of an easy deep slow breath. I focus on being grounded: I put my feet on the ground. Just like those before me, I am connected to the earth. Through the rug beneath me, through the concrete floors, through the insulation. Through the gap where the floor sits, to the ground, I am connected. I breathe. I feel my feet gently hug the ground. Nothing is straining. All is resting gently. I wiggle my toes. I feel them move in my shoes, on my flip flops. I feel them move and then I rest them. Softly on the floor. I shift my weight. To the right and to the left, I shift my weight from my heel to the ball of my feet to my toes and back again. I rest. I know that this point of contact with the ground will keep me here. get back to the warmth of my big heart. And before I know it. I’m calm. This is an amazing app that offers so much – for free! I often search it for “sleep” to help me drift off to dreamland or “one minute” for a quick de-stressor. Andrew Johnson, the hypnotherapist, ( https://www.withandrewjohnson.com/ ) is my go-to meditation guru. His voice eases me like warm tea on a cool day, like ginger on an upset stomach, like, well you get the idea, right? He has this voice that really lulls me. I have a lot of his apps but you can also find some of his work on InsightTimer -for free. Search his name and there they are! It’s fabulous! I love Headspace. https://www.headspace.com/ It’s several episode, free course shows how to meditate and why. It’s easy to use and well worth 10 minutes a day! There are many more apps out there. Right now, on my list to check out are Buddhify (buddhify: mindful meditation at https://buddhify.com/ ), Calm (https://www.calm.com/ ), and 10Percent Happier http://www.10percenthappier.com/ . What are your go-to apps or exercises for releasing tension and worry? Please comment below with your thoughts and resources. 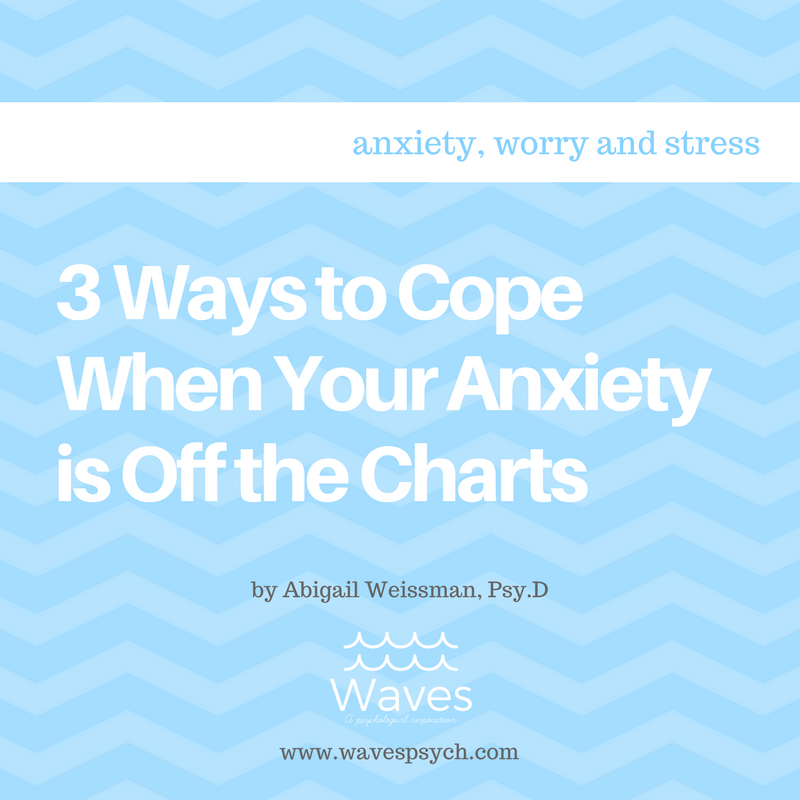 Please set up an appointment to meet with Dr. Abi Weissman or the Waves team at www.wavespsych.com/contact to set up an individualized plan for feeling more at ease today.